Roasting and baking are forms of dry-heat cooking that use hot, dry air to cook food. Like other dry-heat cooking methods, roasting and baking brown the surface of the food, which in turn develops complex flavors and aromas. Incidentally, the browning that happens when we heat carbohydrates (like when we bake a loaf of bread, for instance) is the result of caramelization, while the browning of meats happens because of something called the Maillard reaction. Roasting and baking both require that the food is cooked uncovered so that it's the hot, dry air that delivers the heat, not steam from the food. Because it uses indirect heat, baking and roasting cook food fairly evenly since all of the food's surfaces are exposed to the heat to the same extent. This differs from pan-frying, for instance, where the surface that touches the hot pan gets much hotter than the side that faces up. Though the words "roasting" and "baking" are frequently used interchangeably, some chefs distinguish between the two based on temperature, with roasting implying greater heat and thus faster and more pronounced browning than baking. Others may prefer to use the word "roasting" specifically for meats, poultry, and vegetables, but use the term "baking" for fish and other seafood. Roasting is a cooking method that is typically reserved for superior cuts of meat like beef tenderloins, rib roasts, loins of pork and so on. 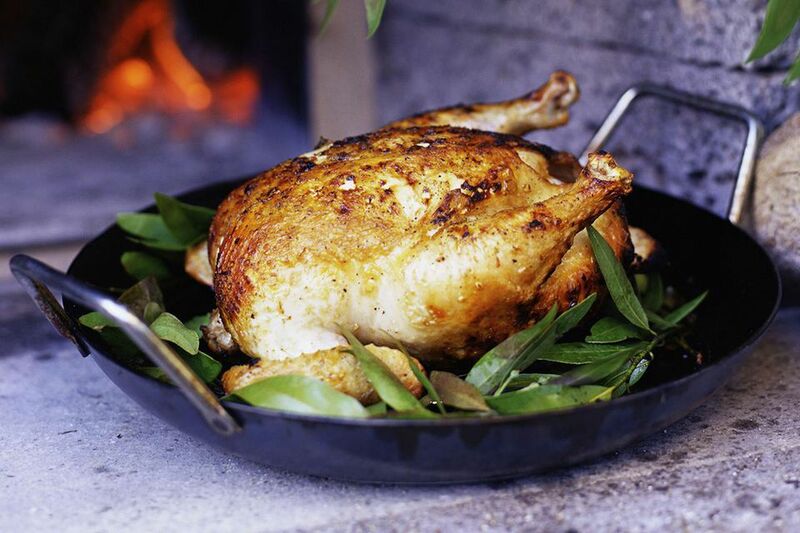 Whole poultry is frequently roasted, too, but this can be tricky as breast meat is drier and cooks faster than leg meat. Here's an article on how to roast a chicken, and here's a nice recipe for roasting a whole turkey breast. Roasting at lower temperatures, between 200 F and 300 F, for longer periods of time, can often produce a more tender, juicier roast, but sacrifices the surface browning which is the source of so much flavor. Conversely, high-temperature roasting can result in a drier roast. As a result, it is increasingly common to roast meats using a combination of low and high temperatures, using a low temperature for most of the cooking time, along with a short burst of high temperature, either at the beginning of cooking or at the very end, in order to achieve the desired surface browning. Fillets, steaks or even whole fish can be baked. With whole fish, the body cavity is often stuffed with vegetables, herbs and other ingredients first. Otherwise, these stuffing ingredients can be placed on top of the fillets or steaks. This helps prevent the flesh from drying out. And speaking of whole fish, the head has a lot of moisture in it, so when baking whole fish, leaving the head on is another way to help keep it from drying out. Fish can also be brushed with oil or melted butter before baking, or even dipped in melted butter. The prepared fish is then baked at around 350°F on an oiled baking sheet. When baking leaner fish, it's a good idea to baste it with oil, butter or some other liquid during the baking, so that it doesn't dry out. Should You Modify Your Smoker? Is Grilling the Same as Barbecuing? What is Convection and What Does it Have to Do with Ovens? What is the Best Way to Roast Green Chiles at Home? What's the Difference Between Cooking Wit 'Dry Heat' vs 'Moist Heat'?